I am creating an application for a client, it is essentially a large data table with many rows that they use to monitor the state of the systems (each row is a different system). Some of the columns track when the system needs a person to go physically and attend that system, if the system is not checked when it is indicated to do so, it would be catastrophic, so the indication to do so must be clear and always visible. The client has specified that this information must be presented in a orderly data table. 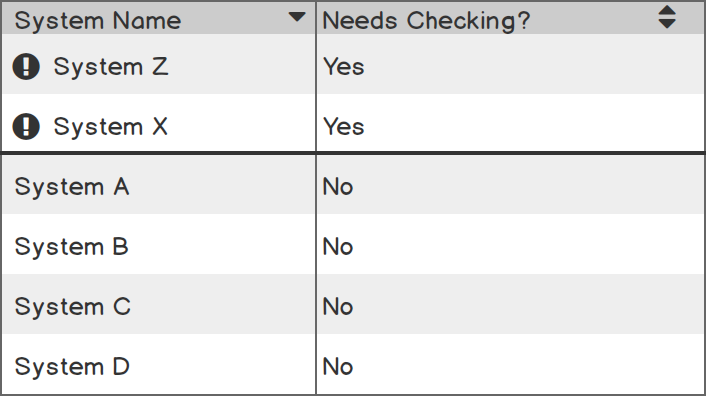 I feel that the best way to present the important elements so that they are visible at all times is to move these rows to the top of the table when they require the user's action (for example, someone to go to and perform the physical verification of the system) , there will only be each time there is a maximum of 2 or 3 rows that must be checked at any given time. The problem that I am struggling with is how to show that these rows are not included in the classification of the table. 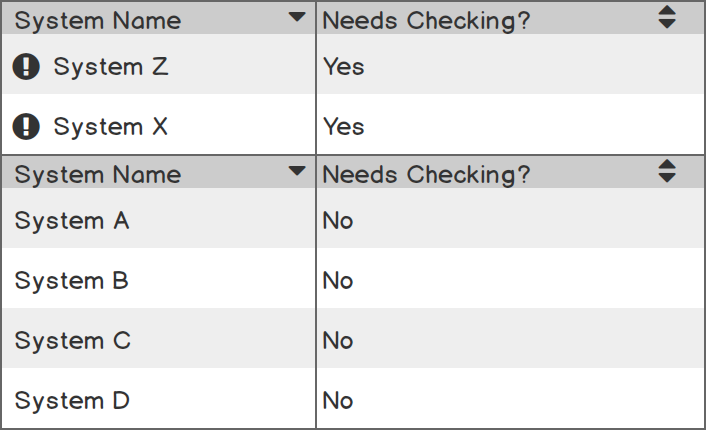 For example, if the table is sorted by System Name – Alphabetically, but the top two rows are important, so System X and System Z are displayed before System A. But I think that might not be a strong enough visual clue, especially as in Excel, the columns would still obey the classification of the table, they would simply freeze to the top. Although, I feel that this is much less elegant, and my client is incredibly nervous about the vertical space. Nor am I sure that this is more intuitive than the first example. Does anyone know in a way that this has already been achieved in other places? Or suggest how you could handle this type of situation? Note: The previous screens are an incredibly simplified version of the real tables, which are 12 columns, 5 of those columns are related to a different verification of the systems. Previous Previous post: If I send bitcoin or some other cryptographic from my wallet to Binance and I do not see a deposit, what could go wrong? Next Next post: Encryption – How to change the password of the SQL Server master key?